This 92 year old patient came into our office for evaluation of #7. She reported no pain, but had a sinus tract between #6 & #7. Probing around #7 appeared normal. The radiograph appeared to show some lateral radiolucency at the level of the post. 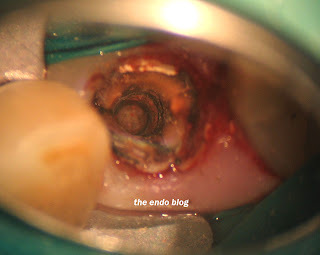 The post also appeared slightly off angle with the root canal obturation. Despite the lack of narrow probing depths, I suspected a root fracture. At this point, we decided to verify that fracture by disassembling the restoration. 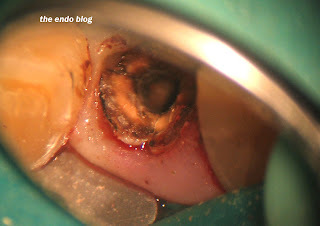 The patient was informed that if the root was fractured, then she we would not be able to save the tooth. After simultaneous removal of the post and crown, multiple vertical root fractures were identified. A lingual, and distal fracture are seen in this image. A mesial root fracture is seen in this angle. Visualizing a fracture is the only certain way to diagnose a root fracture. This procedure is not well reimbursed, if at all. It will certainly require time that could be used for more productive treatment. However, if it was my tooth, I would want to know it is fractured before extracting it. I suspect that a possible application of the new cone beam dental CT's will help with diagnosis of vertical root fracture. Nice pictures.. But i was just wondering if fractures get initiated while removal of such a post and core system. With most of my extracted teeth exercises on cast metal post and cores,the root just gives up on an attempt to its removal. 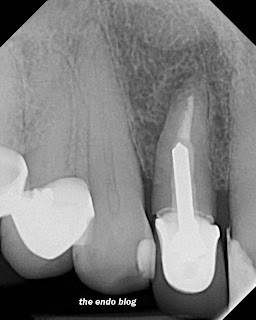 How common are root fractures on anterior teeth, even with aggressive radicular preparations such as this? I would suspect maxillary premolars and mandibular molars have a much higher fracture rate. Are there any papers on this? It's nice that you performed this procedure for this patient however, don't you think it's a little overkill since she's 92 years old?! Now, if she was symptomatic then that's one thing...it doesn't sound like she was...If that's the case, I wouldn't put this patient through all of this...what's the point?? That's kind of a silly comment. It's really up to the patient to decide how important the tooth is to them at their age. I've had much younger, terminally ill patients choose to do similar treatment knowing that they don't have much time to live. It is possible for a 92 year old to outlive any of us.